Bottles for Change grew out of a partnership between Bodhi Education Project and Positive H2O…two local groups that think protecting our oceans is hugely important. We also believe that empowering our youth is one of the best ways to create change. Through collaboration with Hawaii Wildlife Fund and other local organizations, Bottles for Change will begin school and community presentations to increase awareness regarding the impact of plastics on our land and ocean environments and to encourage youth participation in the Bottles for Change Challenge. The most amazing thing about Bottles for Change is that it is powered by our youth. Kids are “beautifully relentless”! and they have the potential to inspire us all to change, to grow, and to come together as a community. The Bottles for Change challenge leverages the power of kids to teach Hawaii–and beyond–about the harmful impact of plastic on our environment. 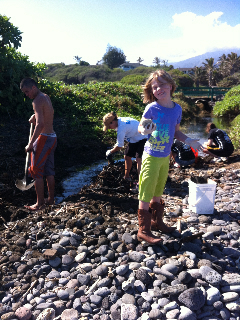 Our keiki will remind all of us how changing one simple thing can make a HUGE difference for our planet. Each child will find an empty plastic bottle that has been abandoned or is headed for the recycle bin or landfill, and they will turn it into their “bottle for change”. Every time they, or someone they know, chooses NOT to buy a plastic bottled beverage, and uses an environmentally friendly alternative, they put the money saved into their “change fund”. They keep track of the money earned, and once their bottle holds $20 for change they hand it in at a designated “bottle drop” (school office, teacher representative, community partner). Each Bottle for Change includes the participant’s contact information so that they can receive their 4B4C t-shirt, reusable water bottle, and raffle entry for one of 8 great prizes! In addition to the individual challenge, schools receive points for every bottle handed in by one of their students! 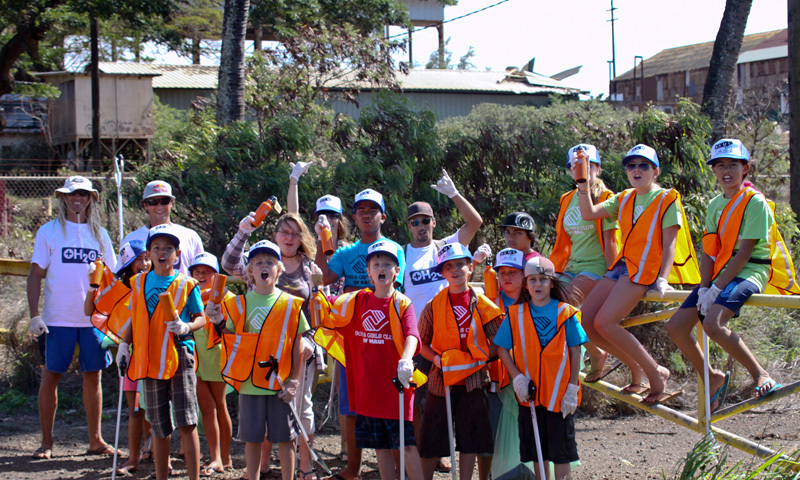 Schools also earn bottle points every time a student (or school community member) volunteers at a Hawaii Wildlife Fund or Positive H2O beach cleanup event. Winning schools will receive free environmental educational outreach programming, supplemental materials, and will be recognized on the Bottles for Change website. Bottles for Change will: raise awareness of the environmental impact of plastics; raise the social consciousness of children; reduce Hawaii’s “plastic” footprint; create opportunities for volunteerism in youth; empower our keiki as change-makers; and develop innovative educational programs that will protect our environment for future generations. 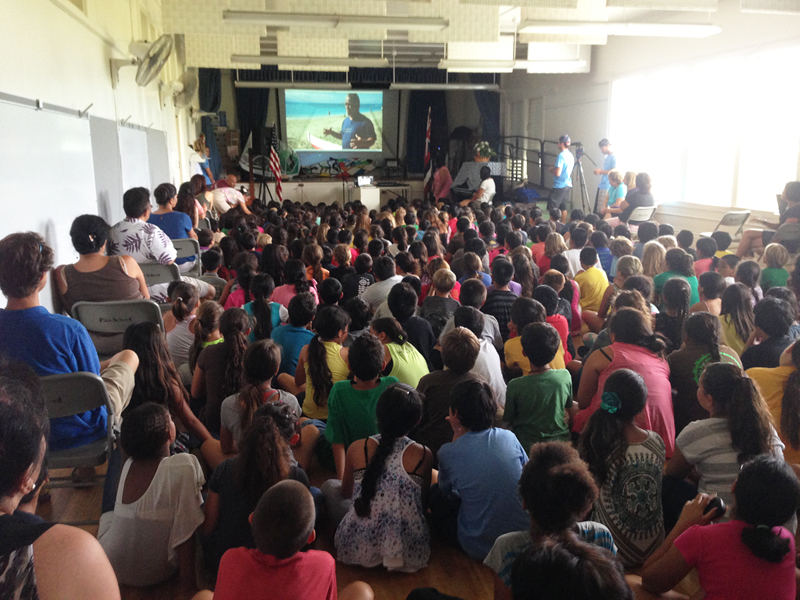 We launched our pilot B4C Challenge at Paia Elementary on April 16th, 2013 with lots of cheers and incredible excitement, energy, and determination from the entire 10-and-under audience. The Paia students were AMAZING and worked incredibly hard during our time with them. They cleaned beaches, raised close to $1000 in “change” funds for educational programs, and completed weekly challenge projects exploring new solutions to the plastic problem. One student even went home and announced to his grandmother, “Tutu! You can’t buy plastic soda anymore! It’s going into the ocean!” Students at Paia participated in fund raising, community beach clean-ups, and educational projects for one month. We wrapped up the B4C Paia pilot program with a school-wide Change Celebration in May to recognize the positive impact of these young change-makers and thank them for their hard work. Several local businesses and organizations (Hawaiian Island Surf & Sport, Da Kine, Flatbread Pizza Co., Big Kahuna Adventures Maui, Rick Kepler, Sailboards Maui, and Maui Country Club) donated raffle prizes for the event. Currently, as of January 2015, Lindy Shapiro is promoting Bottles For Change across Hawaii in a month long effort to raise awareness for this plastics initiative and others- Its called HoloHI, and she is running 750 miles, SOLO, to help this program! Follow her on Facebook and check out the HoloHI.org site as well. A portion of funds raised through Bottles for Change will be used to grow the initiative so that schools statewide, and beyond, will be able to participate in the Challenge and help reduce the amount of plastic debris in our oceans. Remaining funds will be used to establish and develop educational programming focused on enduring positive environmental change. These programs will be available to all participating school and community youth groups through ongoing outreach projects and online resources. We hope to inspire and empower our youth to be change-makers for our planet. We want to create unique and exciting learning environments that challenge students to explore and to imagine—to dare to solve the problems facing our world today. Through an inquiry-based, field study approach, our school programs will take students outside of the classroom to where they will see that truly anything is possible.